MakerBot has become an important tool in more than 5,000 schools throughout the United States, and others around the world. Many more teachers would like to introduce 3D printing to help their students learn to collaborate and solve problems, and prepare them for the jobs of the future. To teach something, however, you must first learn it yourself. 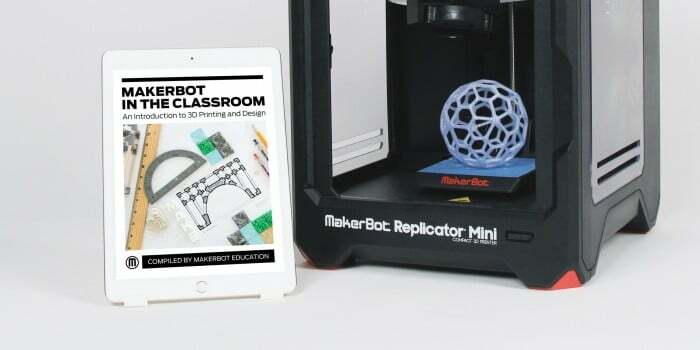 For teachers out there who may have never used a 3D printer before, MakerBot has created MakerBot in the Classroom: An Introduction to 3D Printing and Design. This handbook, which also has plenty of useful information for teachers already familiar with 3D printing, is divided into three sections: a primer on 3D printing technology; explanations of how to download, scan, and design models to print, and sample 3D printing projects. Each project introduces a different free 3D design software tool. For example, the Make Your Own Country, which casts students as surveyors of a new land, starts in Tinkercad. You can download MakerBot in the Classroom for free if you’ve registered your MakerBot Replicator. A sample chapter and project are available free to anyone. This handbook is part of an ongoing effort to provide better support for 3D printing in classrooms and on campus. Other materials are available at the new MakerBot Education Resource Center.